Thursday – UK – Bank of England Cash Rate remained unchanged at 0.75% as widely expected. Thursday – AUS – NAB Business Confidence fell from 3 in the September quarter, to 1 in the December quarter. 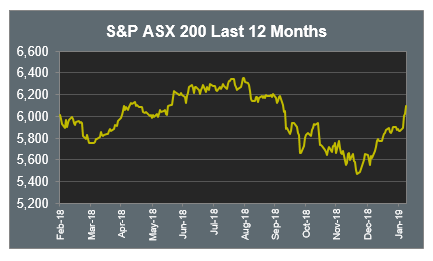 The Australian sharemarket rose to fresh four month highs up 1.1% yesterday, as all sectors gained, with the exception of Utilities. The Financials sector led the gains, with the big four banks all rising over 1%, Commonwealth Bank led the pack up 2%. NAB was placed in a trading halt due to leadership changes following the Royal Commission, which later saw Chairman Ken Henry and Chief Executive Andrew Thorburn both resign. AGL Energy fell 4.8% after the company decided not to recommence share buy-backs due to policy uncertainty. The fall came despite releasing strong half yearly earnings, lifting underlying earnings by 10%, to $537m, and declaring a slightly higher dividend of $0.55 per share. The result was boosted by higher electricity prices. AGL maintained its guidance for the year. The Australian futures market points to a 0.7% fall today, being driven by weaker overseas markets. European sharemarkets fell on Thursday, weighed down by a downgrade to European growth forecasts, as the European Commission lowered its 2019 forecast from 1.9% to 1.3%. The UK FTSE 100 lost 1.1%, the German DAX fell 2.7%, while the broad based STOXX Europe 600 fell 1.5% after seven days of gains. US sharemarkets also fell overnight on worries about the progress of the US-China trade negotiations. White House economic adviser Larry Kudlow told Fox Business Network there was a "pretty sizable distance to go" in the trade talks. The downgrades to European economic growth forecasts also weighed on sentiment. The Dow Jones and S&P 500 both fell 0.9% and the NASDAQ lost 1%. The report card on the US earnings season reads quite well so far, with about half of the S&P 500 companies having reported their fourth quarter results. 70% have reported a positive net earnings per share surprise and 62% have reported top line sales results above expectations. 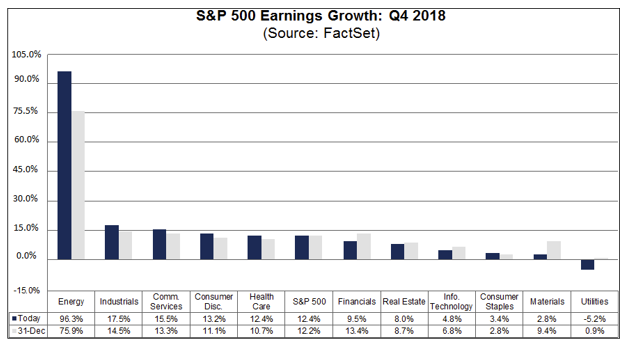 The aggregate S&P 500 earnings growth outcome is hovering around 12% year on year. If this remains the case, it would mark the fifth straight quarter of double digit earnings per share growth. The estimate for 2019 calendar year is earnings per share of around 5.5%, rising to 11% in 2020. The last couple of years has certainly seen some outstanding US company earnings growth and, as expected, this is starting to taper off now.